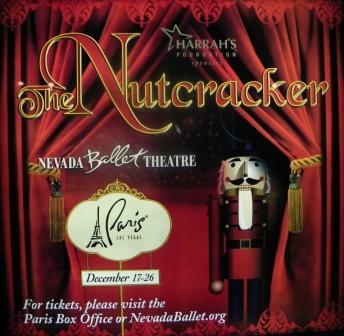 Anastos was the choreographic brain behind this year’s production and his whimsical movement, while not vintage “Nutcracker,” somehow suited the Las Vegas aura. Holly Madison of “Peepshow” at Planet Hollywood also had a brief cameo in a matinee performance. Balletomanes might be cringing, but it’s hard to argue with something that makes a classical ballet more approachable to a wide audience. As a whole, the ballet fit the bill as a sugary-sweet holiday confection. Warm pantomime set the scene in the first act, with children carrying garlands and gifts madly dashing around decked-out adults. An air of geniality mantled the party scene and the exuberant academy students lent a rosy glow. Marcus Bugler as Herr Drosselmeyer was wisely cast; his effervescent animation of the magician was infectious as he ushered the children and the plot along. Josue Calderon and Betsy Lucas as Fritz and Clara, respectively, embodied bubbly excitement admirably. The brief pas de deux between Clara and Preston Swovelin’s Nutcracker Doll in the first act was delightfully sweet and sincere. Leigh Hartley’s Ballerina Doll would have been the perfect object of a young girl’s affection, blowing kisses and tottering about. The Mouse Doll, danced by Ariel Triunfo, was spunky and precise, eliciting laughs from the audience in short order. The battle scene, populated as it was by munchkins in mice costumes, continued the adorable ambience. The Snow King and Queen, danced by Grigori Arakelyan and Leigh Hartley, amplified the dreamlike nature of Anastos’ choreography. Hartley’s airy suspension suited the role, although the multitude of partnered penches left the audience with an inkling that Hartley could do more — with one of her exemplary side extensions, perhaps. Nonetheless, the delicately falling snow was another Las Vegas Easter egg and the frosty royalty, accompanied by flurries of Snowflakes, concluded the first act well. The Kingdom of Sweets, enchanting as it is, was further exemplified by Anastos’ playful choreography. Sarah Fuhrman’s pert Sugarplum and Amy Von Handorf’s Arabian variation stood out as especially fresh, and Jeremy Bannon-Neches as a grandiose Cavalier was a strong complement. While purists might dispute the contemporary riffs, the modifications were refreshing for a ballet with such tenure. Zachary Hartley was outstanding in an unorthodox, one-man Russian variation, wowing the audience with robust displays of double fans, coffee grinders and high-flying leaps. Alissa Dale’s Dewdrop Fairy flounced delicately with a company of flowers in the iconic waltz, the length of which was offset by the activity that remained at a nice simmer. The Spanish chocolate was full of spice and sass and the reed flutes number was a gilded and candy-sweet affair. The bright and chipper Chinese tea number and NBT’s signature saltwater taffy sailors rounded out the act in fanciful style. Overall, NBT and Peter Anastos seem to be a good match. Perhaps the biggest tragedy in the show was the lack of live music, especially in a city that is full of more-than qualified musicians. Beyond the holidays, though, Canfield’s willingness to experiment bodes well for a company that will soon have large slippers to fill. In May, the company will be stepping into a theater at the Smith Center that will seat more than 2,000 people, which is a daunting prospect for any regional company. However, NBT seems well positioned to make this transition, and being backed by the Las Vegas Philharmonic (also at the Smith Center) likely won’t hurt either. Nutcrackers are creaking to life all over the city, trailed by sugarplum fairies and tragicomedy clowns alike. Nevada Ballet Theatre’s classic production is holding down the fort for the ballet purists while Insurgo Theater continues its tradition of a postmodern stage show at the Plaza. Update, Dec. 20: Click here to read Julia Osborne’s review of NBT’s “Nutcracker” on the Las Vegas Review-Journal website. Ticket prices range from around $38 to about $131 and matinee and evening performances are available. For more information and to reserve tickets, click here or call 702-946-4567. Insurgo is turning tradition on its head in typical indie-theater style. “The Insurgo Nutcracker,” now in its third year, will run from Dec. 19 through Jan. 7 on the third floor of the Plaza Hotel and Casino downtown. This year’s iteration will incorporate new characters with a cast of the tried and true. The performance will feature dancer and actor Michelle Meyer and actress and vocalist Melanie Ash, with actor Brandon Oliver Jones as the titular Nutcracker. Happy holidays from the Las Vegas Dance Insider! May your heads be filled with visions of sugarplums, or dumpster-diving Samuel Beckett-style traicomedy clowns, or whatever. Cheers! The Vegas Nutcracker season was wrapped up and topped with a bow by NBT’s rendition, performed at the Paris Las Vegas Theatre from Dec. 17 to 26. The ballet was choreographed by Peter Anastos and displayed a commendable balance of visual razzle-dazzle and simplicity in its production and choreography. The company, under the artistic direction of James Canfield, was well-polished and the students, from the Nevada Ballet Theatre Academy, did a very respectable job. Anastos’ choreography contributed a revitalizing energy to a show that has been performed by NBT for 29 years. The production quality, from lighting (by Nicholas Cavallaro, executed by Peter Jakubowski) to costuming and sets by A. Christina Giannini, was excellent. The theatrical nature demanded by Peter Tchaikovsky’s iconic score was beautifully presented in the dramatic red, black and gold theater. For those already familiar with the story of Clara and her beloved nutcracker doll, there were few surprises. The story began with Clara (Leigh Hartley) and her brother Fritz (Benjamin Blomquist and Gene Mesheryakov) joining their parents for a festive party in honor of the season. Children and adults alike danced in turn, with both groups embodying the rosy-cheeked holiday spirit. NBT’s version featured several notable sections in the party scene. The children performed a garland dance, May-pole style, in the middle, and their sliding chasses were a credit to their training. Spirited characters like Clara’s grandparents (Jamey Gallagher and Tara Foy) added a good measure of humor. Drosselmeyer (Marcus Bugler), the magician that presented Clara and the other children with the nutcracker doll (Griffin Whiting) mechanical mouse (Aimee Schleimer and Ariel Triunfo) and ballerina doll (Betsy Lucas and Kelly Callahan), was properly dramatic and set the magical aspect of the story into motion. After the battle scene between the Mouse King (Anthony Paparelli), white mice (played by children and an NBT addition to the original) and the Nutcracker Prince, the prince took Clara on a journey to the Kingdom of Snow and the Land of the Sweets. This is where the meaty dancing comes in. Fierce snowflakes in the Kingdom of Snow, coupled with the commanding presence of the Snow King and Queen (Jeremy Bannon-Neches and Sarah Fuhrman), did justice to Anastos’ regal and flurry-ful choreography. Strong technique was evident in seamless turns and extension, fluid partnering and Bannon-Neches’ grand pirouettes. The “snow” falling onto the dancers was a nice theatrical touch. Fog and the demur bourreeing of angels en pointe heralded Clara and Co.’s arrival in the Land of the Sweets. Alissa Dale’s Sugar Plum Fairy, with neat footwork and elastic port de bras, shimmered in an iridescent purple tutu. With her Cavalier (Grigori Arakelyan) beside her, she introduced the rest of the delectable treats heralding from the Land of the Sweets. Each of the national dances was distinct, lending (if you will kindly pardon the pun) unique flavors with each variation. Another sweet addition came with the miniature corps, small both in terms of size and in terms of stature: Young ballet students constituted a supporting cast for each of their full-sized counterparts, scuttling around as travel-sized Spanish chocolate, French marzipan and the like. The second act also featured some NBT innovations that made nice addenda to the original. Pint-sized bakers assembled a three-tiered cake and salt water taffy sailors bounced buoyantly with aquatic-themed props. The Dewdrop Fairy (Krista Baker) and her company of flowers glimmered as a high point in the act. The dancers were clad in flouncing romantic tutus in a pink gradient and looked appropriately like gumdrops, albeit graceful ones, with spidery limbs. Developes en menage, coupled with the skirts, created a particularly striking visual and Baker’s controlled suspension and pristine fouette turns were not to be discounted. The grand pas de deux that led into the finale of the show was a revitalizing, candy-coated affair. Anastos’ choreography entailed a good measure of both solo sections and unison, allowing the audience to see the individual personalities of the variations before wrapping the entire thing up neatly. Dale’s Sugar Plum, backed by her Arakelyan Cavalier, again directed the proceedings. With a partnered quadruple pirouette to a picturesque arabesque, she was the beautiful bow on top.